sailboat. : Current Make Up Collection + Storage! I'm still working on decluttering my life, some areas are more difficult than others but my make up collection was a lot easier than I was expecting. Four years ago I dreamt of having an extensive array of make up to choose from each morning, but now a small selection of things I really love is infinitely more appealing. My make up used to live in three sets of three acrylic drawers and that was part of the problem; I had a real desire to fill them up. And I almost did before I decided enough was enough. I sorted through each drawer, keeping things I really loved along with things I wasn't totally impressed with but would use up, and parting with everything else. It was a very therapeutic process. I'm still working on using some things up that I wouldn't repurchase, but I've promised myself that I'll do that before buying anything new and if there's anything in there that I haven't reached for in 3 months it has to go. 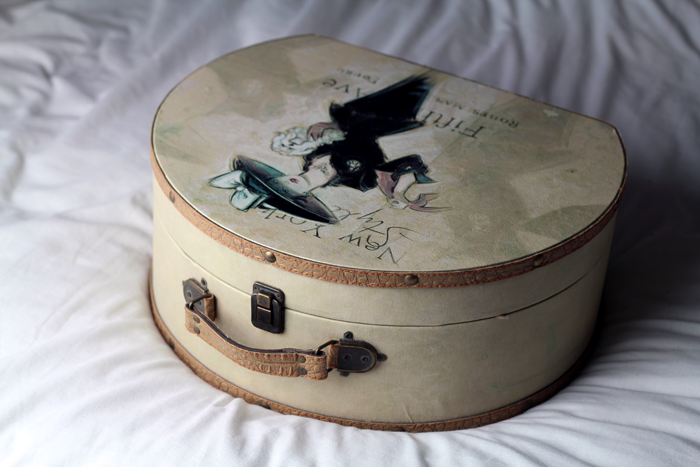 This vintage style case was a TK Maxx find many years ago. It had been sitting in a cupboard for a while not doing anything and I thought it would be the perfect size to store make up so I dug it out and I'm quite happy with it. Everything is in one place so I don't have to go rooting around in drawers and the whole thing is portable so I can do my make up anywhere in the house now. All my cheek products fit nicely inside an old beauty box and my lip products are in an acrylic container, which means they all stay together and there is some kind of organisation. Without those in there it would get very messy, very quickly. It's almost due for another mini declutter, some foundations, mascaras and lip products are getting close to their use by dates and there are some brushes I don't use, but aside from that this is my current make up collection. I love the vintage case! Your collection looks so organised compared to mine - I really have some work to do haha! Such a lovely way to store your makeup! The case is so gorgeous, great idea! Aw that's so cute! I dont have much so all mine is in a zip-up case. Aw that's so cute! I don't have much, so all mine is in a zip-up case. Wow, great make-up collection! And I love the case you keep everything in! 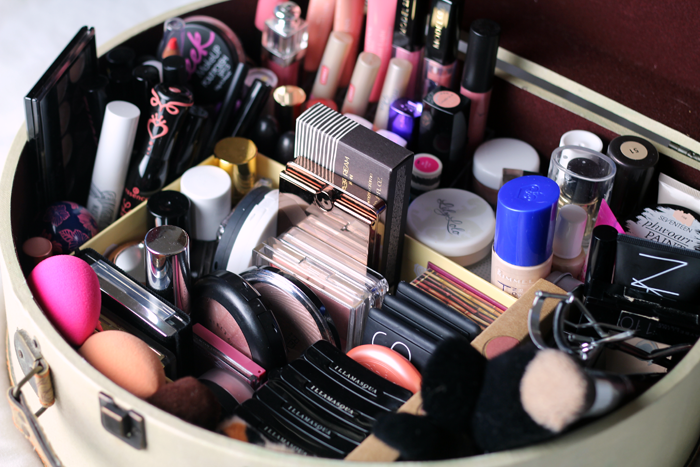 This is such a lovely creative way of storing makeup! So pretty! O vau, perfect! I'm envious at your well picked collection *. * I need to declutter mine, immediately! I really like the way you store your make-up. It's very neat, everything has its place, and with such a limited space, there's no room for unnecessary things. I decluttered my make-up collection as well and tried to keep only the things that I really use. I gave everything else to my sister-in-law and niece, and they were quite happy. This is such an adorable little setup, and so much more fits in there than I would have expected! I store my everyday makeup in a large makeup bag and everything else under my bathroom sink in assorted other makeup bags. I definitely need to have a declutter soon! Love your storage solution! I have been trying very very hard to de clutter my life & in that process makeup has been quite hard. I'm taking it slow but have managed to cut down the size of my collection - I still have a long way to go but I already feel better with less. That is such a cute way to store your makeup! I store my everyday things in a small cosmetic pouch. And for the other bits and bobs its just in a drawer along with unopened lotions, hair ties and other bits and bobs. TK Maxx is great for unique sort of things like that case. I also find a lot of bargain high end makeup there but I probably shouldn't tell you that hehehe. I love seeing this and hearing about how you did it! Thx for sharing! I have started to pop a little date onto my foundations as I can never remember when I opened them. 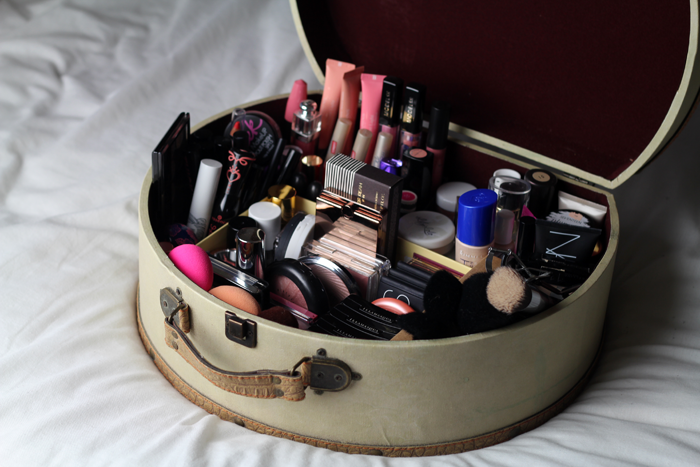 haha, i keep my makeup stuff in a mini suitcase like this too.